Cleaning between the teeth is essential for healthy teeth and gums. In fact, it is just as important as brushing. There are several different methods available for achieving this goal, including floss, interproximal brushes, dental picks, and Waterpiks. Today, our team at Metropolitan Dental Care discusses the key differences between traditional floss and Waterpiks. When you attend a dental visit in Lone Tree, we can help you determine which technique will be most beneficial for your oral health needs. A Waterpik – or a water flosser – is a device that emits a thin, strong, stream of water. This jet of water is directed between the teeth to rinse away food, debris, and other irritants. The Waterpik brand was the first water flosser to receive the ADA Seal of Acceptance. Through vigorous clinical trials and testing, the Waterpik was found effective for the removal of plaque and the prevention of gingivitis. While Waterpiks are excellent for removing large food particles and debris, they simply cannot remove plaque and biofilm as traditional flossing can. Imagine taking your car to the car wash. When you use the hose to clean your car, it rinses away the mud and dirt. However, if you run your finger along the side of the car door, there is still a film present. This film cannot be removed without a sponge or brush. The same is true for your teeth. A water flosser can eliminate the large particles, but it will not remove the biofilm that accumulates on the teeth surfaces. This sticky, glue-like substance is responsible for disease-causing bacteria. Therefore, removing biofilm is essential for long-term oral health. Even though most of us understand the importance of interdental cleaning, only about half of all Americans floss every day. In fact, approximately one in five individuals don’t floss at all. In contrast to Waterpiks, traditional dental floss provides direct contact with the teeth surfaces. This removes plaque and biofilm more effectively. These are all things that can be explored in more detail during your dental visit in Lone Tree. 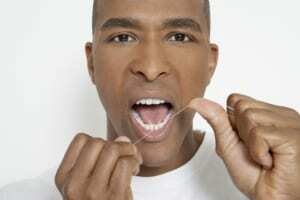 Traditional dental floss: Take a piece of floss about 18 inches long and wrap the ends around your middle fingers. Using the index fingers and thumbs to guide the floss, gently slide the floss between two teeth. Wrap the floss in a “C” shape around one tooth and move it up and down approximately seven to 10 times. Wrap the floss around the neighboring tooth and repeat the process. Interproximal brushes: These tools are excellent for patients who have some spacing between the teeth. They are also useful for cleaning underneath bridges effectively. The small brush head fits comfortably in hard-to-reach areas. Dental picks: This tool resembles a plastic toothpick with a texturized rubber tip. Typically, dental picks are smaller than interproximal brushes, and can effectively remove plaque between the teeth. Floss threaders: Patients who have dental bridges or other appliances will need to clean around or underneath their restorations. Floss threaders are simple tools that help guide dental floss under braces, fixed bridges, and dental implants. Because each patient is unique, what works well for one individual may not work well for another. During your dental visit in Lone Tree, our hygienist can help you determine which interdental cleaning device will effectively meet your needs. Metropolitan Dental Care is proud to serve Denver, Lone Tree, Centennial, Highlands Ranch, and Parker. Our experienced team consists of both general dentists and specialists so that our patients can receive the most comprehensive care possible. To learn more about at-home oral hygiene, or to schedule a consultation at our practice, contact us online or call us at 303-534-2626.